We addressed two commonly held beliefs in Real Estate – house price increases are a good thing, and low mortgage rates signify the proper time to buy. In this article, let’s look closer at the latter statement, and come up with a graph which combines January 30-year mortgage rates from the St. Louis Fed, median household income and January median home prices from the Census Bureau. 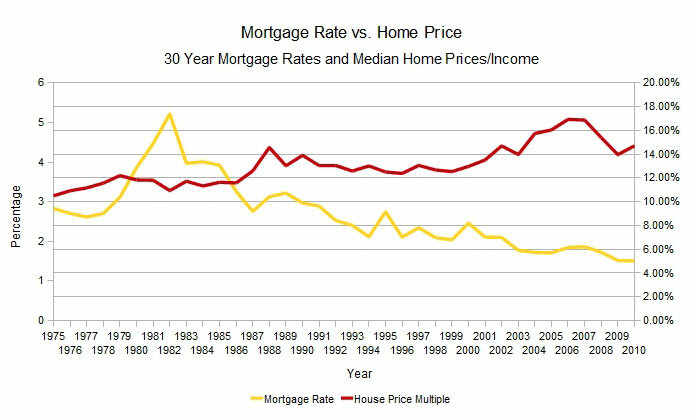 We can’t use the DQYDJHAI in this instance, since it uses the mortgage rate as a factor in its calculation – so rapidly increasing mortgage rates will make homes unaffordable by the way we constructed it. Let’s look at something else – the home price to median salary multiple. If low mortgage rates do truly increase prices and high mortgage rates increase prices, we should see a nice negative correlation between the two (we do, -.65 using the January numbers from 1975 until 2010). We’re using median income and home prices to determine affordability, but not everyone in America owns their homes. It is north of 60%, but even so, a person of median income would likely pay less than the median home price when going to purchase their home. There has been a population increase from the 1970s, and some of these numbers might reflect this (312,000,000+ today, versus around 216,000,000 in 1975.) Shifting demographics – more people wanting to buy homes would also have a forcing effect on prices. Inflation is a factor, but we’ve partially covered our bases by using median income – which should increase right along with inflation. Plus even through years which we know had higher inflation (mid-70s through early 80s) the home price multiple stayed pretty steady. We cherry picked 1975 through 2010 since that data was easiest to come by. Using data from say Robert Schiller, going back to the 1800s, might lead to different results. Regardless, there is a reason to believe that the best deals don’t come in low interest rate environments. Even the last three years are only about as much of a deal as the early 2000s and late 1980s by that valuation. Perhaps a better statement is, “High mortgage rates mean it is a good time to buy a house, and low interest rates mean you should refinance”? Discuss in your comments – and remember your situation is your own, so please consult the proper authorities, financial advisers or otherwise, for your own situation.